The atmosphere was tense as a woman in her late forties stood up among the hundreds of people sitting in a community centre in the Eglinton-Lawrence ward for a public consultation meeting. It was Jan. 12, 2012, and Coun. Josh Colle had called the meeting to get feedback from his constituents about an upcoming city council vote on the city’s budget. Although the woman at the meeting spoke in Eglinton-Lawrence, many social services providers are now echoing her in Wilson’s own home community, Ward 13, Toronto Centre, where Ryerson is located. They too fear the consequences that having another fiscally minded Ford in power, this time as premier, will have on funding for social services. The issue has become particularly pressing for them, since a report released on Oct. 1 shows that Toronto Centre is the ward with the highest rate of child poverty out of Toronto’s 25 wards. Fortyfive per cent of children in Toronto Centre live in poverty, almost double the 26.3 per cent of kids who live below the poverty line in Toronto as a whole, the report by Social Planning Toronto states. 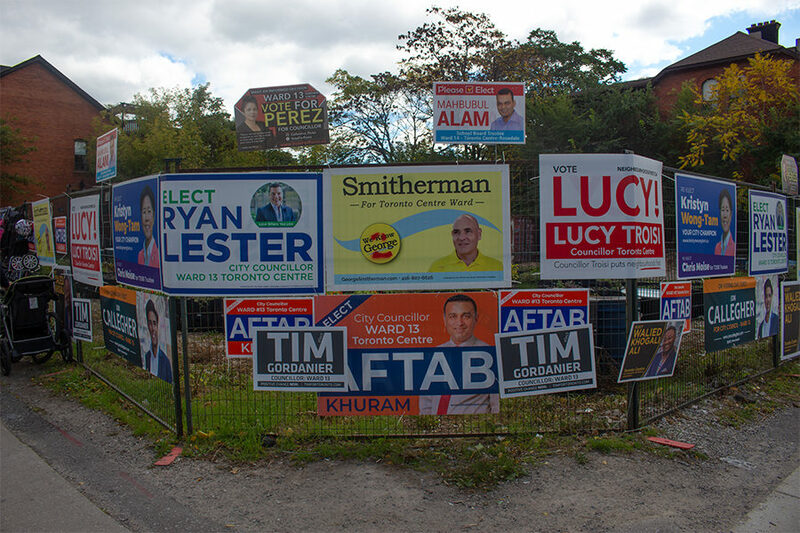 Ryersonian reporters looked into why our ward has the highest rate of child poverty in the city so that residents of Toronto Centre, whatever their political affiliation, can be as informed as possible about their ward when voting in the Oct. 22 municipal election. With the new 25-ward system, the eastern boundary of Ryerson’s ward extends to the Don Valley Parkway, drastically changing Toronto Centre’s constituents: the highest concentrations of child poverty are all in pockets that fall east of the ward’s previous eastern boundary at Jarvis Street. However, Philip Unrau, the vice-president of research and innovation at Central Neighbourhood House, says these areas were not always the ward’s poorest. Established in 1911, Central Neighbourhood House is Toronto’s first-ever secular settlement house. Today, it is located at Gerrard and Ontario Streets, but it first opened its doors at Bay and Gerrard Streets, in what was then the poorest area of Toronto. “It wasn’t uncommon to have 30, maybe even 40, people living together in one room, and most often that room would have just a dirt floor,” Unrau says. “No running water, no indoor plumbing or toilets. There was no electricity.” He explains that Central Neighbourhood House moved east with the people it helped as Toronto’s downtown core developed into prime (read: less affordable) real estate and poor people were displaced. Unrau partially attributes Toronto Centre’s high level of child poverty to “ghettoization,” a historical process in which top-down city planning segregates lower-income families by locating a lot of subsidized housing in certain areas of Toronto. For instance, the City of Toronto built the community housing projects at Regent Park, Regent Park North and Regent Park South from 1947 to 1957 to remedy crime, social issues and substandard housing in the area. 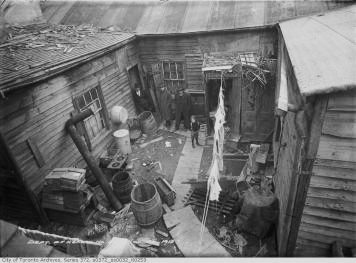 Public health inspectors evaluate the standard of living in a slum in downtown Toronto in 1911. Courtesy City of Toronto Archives. In 1956, the Canadian Mortgage and Housing Corp. even stepped in to pay for a study of Toronto’s “urban renewal” needs. Its initiative gave birth to a modest city renewal plan, and helped draw up the blueprint for Moss Park. The legacy of this top-down management is evident in the report from Social Planning Toronto, showing that 24.9 per cent of tenants in the ward are in subsidized housing, compared to 15.1 per cent in Toronto overall. “The most affordable housing is in Toronto Centre, so that’s going to attract the ones that can least afford housing,” says Unrau. Wilson added that the substantial number of immigrants, refugees and people of colour in Toronto Centre might also explain why the ward has such a high rate of child poverty. The Social Planning Toronto report notes that newcomer Canadians and racialized people experience child poverty at rates higher than those experienced by non-immigrant and white families. However, it is unclear how much of a role the ethno-racial demographics and immigrant status of the population of Toronto Centre plays. Census data shows Toronto Centre is 40 per cent immigrant, a smaller percentage than Toronto’s 47 per cent. Toronto Centre also has about the same percentage of people of colour as Toronto overall, at 49.7 per cent to Toronto’s 51.5 per cent. Toronto Centre does have a larger percentage of Indigenous people than Toronto does, and a staggering 84 per cent of Indigenous families with kids in Toronto live in poverty. Sara Wolfe, an Indigenous midwife at Seventh Generation Midwives Toronto who worked on the report from Oct. 1, explains that it is important to view the “astronomically high” rate of Indigenous child poverty in the context of Canadian colonialism. “The systemic pieces that contribute to Indigenous poverty specifically are very deep rooted,” she says. The report identifies colonialism’s erosion of traditional Indigenous social structures and access to community resources as just two examples of historical processes that have contributed to economic disparities between Indigenous and non-Indigenous families. The segregation of poor people, from the middle and upper class, that occurs in low-income neighbourhoods also perpetuates poverty by creating stigma and other barriers to long-term gainful employment. Unrau says people who use Central Neighbourhood House’s services have self-reported that prospective employers “tend to lose interest” when they find out that job applicants live in Regent Park. “There seems to be a wall that goes up once they establish that fact,” she says. According to Unrau there is also “tremendous pressure” for youth to join gangs in Toronto Centre. The stigma of living in a low-income area and the pressure from local gangs might factor into why Toronto Centre’s official unemployment rate for residents aged 15 and older is nine per cent, compared to the city’s eight per cent. Notably, women in Toronto Centre have a higher unemployment rate than women in the rest of the city. The push towards mixed-income neighbourhoods, as evidenced by Regent Park’s revitalization project, also raises the question of how people from different socio-economic backgrounds might coexist in Toronto’s future. Wilson, for instance, has heard from frontline workers that gentrification of Toronto Centre’s Downtown East has posed a challenge separate from sky-high office rent. “With more gentrification, you can have neighbours who might not necessarily want social services in their community,” says Wilson. 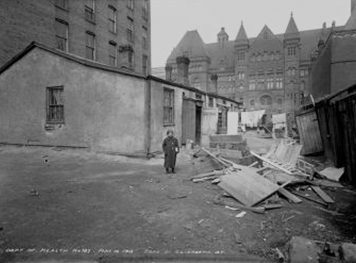 Central Neighbourhood House was first located at Gerrard and Bay Streets behind City Hall, which looms in the background of this photo. CNH has since moved to its current location at Ontario Street. Courtesy City of Toronto Archives. Wilson and Unrau nevertheless agree these services are necessary in this downtown ward. In fact, certain needs are still not being met for low-income residents of Toronto Centre who live there because of the nearby social services and potential affordable housing. At the Central Neighbourhood House, for instance, Unrau notices there are not enough resources to help integrate newcomers. “We’re not providing them with the level of bridging so they can get the certifications they require. So, there’s a lot of overeducated and underemployed or unemployed individuals living in Toronto Centre,” he says. With the municipal election just around the corner, Social Planning Toronto’s report calls on candidates for mayor and city council to respond in bold ways to child and family poverty in the city. Social Planning Toronto’s report urges candidates to commit to, among other things, funding subsidized child care and affordable housing units, working with Indigenous groups on a strategy for reducing Indigenous poverty and collecting demographic data for all city programs and services. Despite worries about how the upcoming election and Ford’s premiership might affect funding for social services, many experts agree that they are inspired by the resilience of the marginalized individuals they worked with. Watching clients who were suffering transform into happier, healthier versions of themselves is one of the most fulfilling parts of the job for Unrau, he says. He remembers bumping into a woman on the street who had once been a client at Central Neighbourhood House. Before, she had been prone to aggressive outbursts due to untreated mental illness. Now, Unrau says, she is receiving treatment for her mental illness and has gone back to school in her late fifties or early sixties. She has become articulate and radiant in her happiness. “She was excited by life,” Unrau says. Wilson also described watching marginalized people work toward improving their lives as something that gives her hope, no matter how uncertain the future looks. “I think I’m an optimist, even in the worst circumstances,” she says. Click ‘play’ above to hear a segment of Ryersonian This Week from October 19, 2018. Produced and written by Tiffany Lam and Max Binks-Collier.